Now in its record breaking 33rd year, Cameron Mackintosh announces major cast changes for the London production of Les Miserables at the Queens Theatre. Les Miserables will undergo major cast changes from 11 June 2018. The show which is the World’s longest-running musical is now in its 33rd year and continues to run at the Queens Theatre. 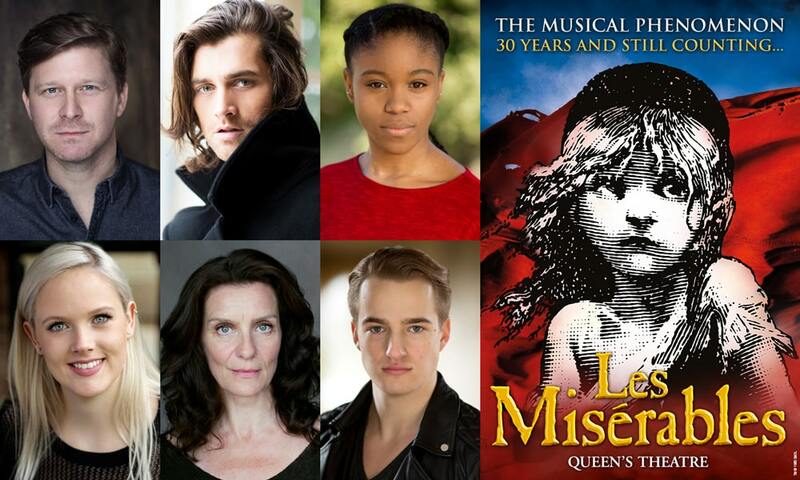 Dean Chisnall will star as Jean Valjean, Toby Miles will play Marius, Elena Skye will play Eponine, Vivien Parry will play Madame Thenardier and Amara Okereke will play Cosette. They will join Steven Meo as Thenardier and Carley Stenson as Fantine who are continuing in their roles. Bradley Jaden will star as Javert from 23 July 2018 when David Thaxton who is currently playing Javert leaves the show. From Monday 11 June 2018 the company will be: Tegan Bannister; Emma Barr; Adam Bayjou; Ciarán Bowling; Oliver Brenin; Dean Chisnall; Grace Farrell; Sophie-May Feek; Adam Filipe; Antony Hanson; Sam Harrison; Barnaby Hughes; James Hume; Ciaran Joyce; Katie Kerr; Rebecca Lafferty; Sarah Lark, Hannah Grace Lawson; Jessica Lee; Jo Loxton; Anna McGarahan; Steven Meo; Toby Miles; James Nicholson; Amara Okereke; Vivien Parry; Carley Stenson; Elena Skye; David Thaxton; Ben Tyler; Joe Vetch; Raymond Walsh and Andrew York. Cameron Mackintosh’s production of Les Miserables is written by Alain Boublil and Claude-Michel Schönberg and is based on the novel by Victor Hugo. It has music by Claude-Michel Schönberg, lyrics by Herbert Kretzmer and original French text by Alain Boublil and Jean-Marc Natel and additional material by James Fenton. The original London 1985 production of Les Miserables is adapted and directed by Trevor Nunn and John Caird.